At the end of my street, in the neighborhood of Northside, is a beautiful old Victorian house. 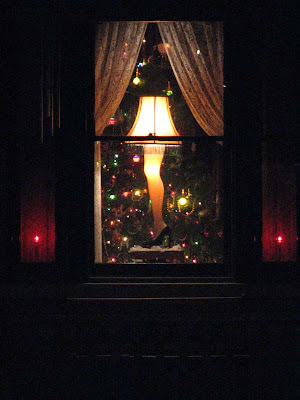 The people that live there decorate the windows each Christmas with lights. The above photo I took on Christmas eve in 2007. As you all know, the Leg Lamp is from the movie A Christmas Story that has become a classic. I would like to wish all my blogging buddies and FB friends a Merry Christmas and a Safe, Healthy and Happy New Year. If we get all that in 2011, we will be prosperous too. And the same heartfelt wishes to you , too, Fred. And I'm sorry to have missed Hanukkah. What was I thinking? Lou, Got your message. Here's wishing you and your family a Merry Christmas and a Healthy and Happy New Year. We got to meet in 2010, and hopefully we will meet again in 2011 too.